I like to bake with bananas as they make things so flavorful and moist. A good example is this Banana Cake, which has the delicate sweetness of mashed bananas with a texture that is wonderfully soft and moist. While quite tasty on its own, I love to cover it with a creamy smooth Chocolate Fudge Frosting. Perfect as a weekday dessert. 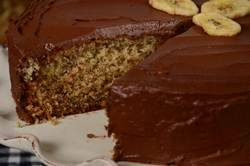 This Banana Cake is a delicious recipe I adapted from The Joy of Cooking. Instead of the more common 'creaming' method where the butter and sugar are creamed together and then you beat in the eggs, flour, and liquid, this recipe uses what we call the 'one bowl' or 'quick method'. This method entails first blending all the wet ingredients (bananas, sour cream, vanilla extract, and eggs) together. Then, in your electric mixer, all the dry ingredients (flour, sugar, leavening, salt, and ground cinnamon) are mixed together. Next, the butter, along with part of the wet ingredients, are beaten into the dry ingredients. This batter needs to be beaten for about 90 seconds (to develop the cake's structure) and then the remaining banana mixture is added. While this method may be a little unusual, it reduces gluten formation which results in a cake that literally melts-in-your-mouth with a velvety texture that is moist and dense. Just make sure to have all the ingredients at room temperature and to follow the instructions on mixing. I baked this cake in a 9 inch (23 cm) round cake pan, but you could bake it in a bundt pan with excellent results. This cake can be stored for several days at room temperature or in the refrigerator. Since bananas go so well with chocolate, I chose to cover this cake with a chocolate fudge frosting. This recipe is one I adapted from the cookbook Chocolate Bar by Matt Lewis and Alison Nelson, who run a chocolate boutique in New York that they call a "candy store for grown-ups". It is the type of chocolate frosting my mother always used to cover cakes. Made with butter, confectioners (icing or powdered) sugar, vanilla extract and unsweetened chocolate, it is perfect for covering cakes and cupcakes. It uses unsweetened chocolate which is also known as baking, plain or bitter chocolate. This is chocolate in its rawest form. Chocolate liquor that has been refined and contains 50-55% cocoa butter. Since no sugar has been added to the chocolate it has a strong, bitter taste that is used in cooking and baking but is never eaten out of hand. When used in this frosting it imparts a deep chocolate flavor. Banana Cake: Preheat oven to 350 degrees F (180 degrees C) and place rack in the center of the oven. Butter and flour, or spray with a non stick vegetable/flour spray, a 9 inch (23 cm) round cake pan. In the bowl of your food processor, place the bananas, sour cream, and vanilla extract. Process just until blended and smooth. Add the eggs and process until combined. In the bowl of your electric mixer, with the paddle attachment, (or with an electric hand mixer) combine the sugar, flour, baking powder, baking soda, salt, and ground cinnamon. Add the softened butter, along with half the banana mixture, and beat on low speed just until the dry ingredients are moistened. Increase the mixer speed to medium (on high if using a hand mixer) and beat the batter for 1 1/2 minutes. Scrape down the sides of the bowl as needed. Add the remaining banana mixture in two additions, beating well after each addition. Pour the batter into the prepared pan, smoothing the top, and bake for about 35 to 40 minutes or until a toothpick inserted in the center of the cake comes out clean. Remove from oven and let cool on a wire rack for about 10 minutes before removing the cake from the pan. When completely cooled, frost with the Chocolate Fudge Frosting. Chocolate Fudge Frosting: Melt the chocolate in a heatproof bowl placed over a saucepan of simmering water (or in the microwave). Remove from heat and let cool to room temperature. In the bowl of your electric mixer, or with a hand mixer, beat the butter until smooth and creamy (about 1 minute). Add the sugar and beat until it is light and fluffy (about 2 minutes). Beat in the vanilla extract. Add the melted chocolate and beat on low speed until incorporated. Increase the speed to medium-high and beat until frosting is smooth and creamy and of spreading consistency (about 2 -3 minutes). Frost the top and sides of the cake. Can garnish with dried banana chips. Can be stored at room temperature or in the refrigerator for several days. Makes one - 9 inch (23 cm) cake.